Shasta Lake is known for great fishing, whether you are an avid fisherman or just getting started, here are some great resources for you to enjoy your trip with us even more. Take a look at where they’re biting, the current catch, & what’s running. Shasta Lake is a two level impoundment that offers habitat for both cold and warm water fish. There are numerous parts all over Shasta Lake of sheer rock walls, large boulders, submerged islands and long points that will attract and hold fish. The habitat for cold water fish is considered respectable; however, habitat for the warm water fish is limited by the absence of shade & cover, water level fluctuations and steep-sided banks. The species of fish in Shasta Lake are plentiful and diverse. Rainbow trout, brown trout, chinook salmon, largemouth bass, spotted bass, smallmouth bass, black crappie, bluegill, carp, Sacramento sucker, Sacramento squawfish, riffle sculpin, black fish, hardhead minnow, white sturgeon, channel squawfish, threadfin shad, white catfish, brown bullhead, golden shiner and green sunfish are a few examples of the many species that inhabit Shasta Lake. Trout and bass are caught most often by anglers. Although there is a bit of natural reproduction, the cold water fish inhabitants within Shasta Lake are mostly maintained through annual stocking with help from the California Department of Fish and Game. The warm water fish inhabitants are self-perpetuating. Jones Valley Resort is one of the three locations where annual stocking takes place on Shasta Lake. The project is a co-op between the Jones Valley Resort, California Fish & Wildlife, Kokanee Power and the U.S. Forest Service. Each year, 450 to 650 rainbow trout are raised and released. The fish cage is stocked the first of November and the matured fish are released in the first part of April. Over the last couple of years, Jones Valley has assisted in the release of rainbow trout that range between 4 to 5 pounds. Rainbow Trout, Brown Trout, Salmon: On the McCloud River Arm, trolling from Turntable Bay to Hirz Bay will typically yield brown trout. The Sacramento River Arm, Dry Fork, Little Squaw creek and Big Backbone Creek will typically yield some rainbows. Fishing for rainbows is generally best at Shasta Dam when the releases are high. Mooching for salmon is best in spring and early summer. During early spring, before the water temperatures begin to warm up, bank anglers can typically catch rainbows, brown and Chinook salmon in the sports mentioned above. By late spring and early summer the trout are moving to deeper, cooler water. Marshmallow and egg mixtures and live minnows, from both shore or boat, two to three feet below a bobber in the spring, or 50´ to 100´ deep in the summer, generally work well. Minnows survive for a longer time and will have more mobility if they are hooked under the spine in front of the dorsal fin. Lures that are confirmed and established producers are: Thinfins in varying colors, Kastmasters, Rebels, Flatfish in Z-r or X-5, Rapalas, and Z-Rays. Trolling at depths of 30´ to 70´ is also effective. During the summer it is suitable to use a diving plane or down riggers. 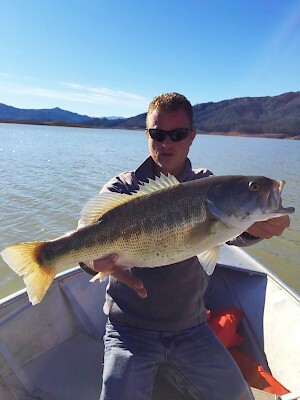 Bass, Catfish and Crappie: Bass fishing on Shasta Lake is good year round. Fishing is finest in the spring and early summer. Spotted Bass are the most common, but Smallmouth and Largemouth Bass are also caught. Plastic worms, spinner baits, swim baits and live bait produce the most, depending on the time of year. Catfishing is best during the spring and summer. Anchovies, chicken liver and “stink" baits are most effective. Fishing after sunset is permitted for catfish. Channel Catfish, White Catfish and Bullheads are all found in Shasta Lake. Crappie can be abundant some years. Crappie populations cycle dramatically, so check with the California Department of Fish and Wildlife to determine availability. Crappie jigs and minnows work best. Flyfishing(Excerpted from VisitCalifornia.com) :"Between the volcanic summits of Mt. Shasta and Mt. Lassen flow some of California’s most celebrated flyfishing rivers. Blue-ribbon waters lace the region, enough to keep the intrepid angler busily searching for trophy-size wild trout. Fall River stands out as 15 miles of crystal-clear, icy cold spring water—aka perfect trout habitat—and the angling showpiece of Northern California. Pit River is a boulder-strewn fantasy of remote canyon waters, a naturally occurring wild trout fishery with a tough reputation. Wade carefully through its swift current, over slippery stones, and you’ll be rewarded with rainbow-filled pocket waters and not a fisherman in sight."